Buy a print copy or download for Kindle . This book inspired me to coin a new term: spacemance! Yes, that's right, a quasi-interspecies romantic saga taking place in space. 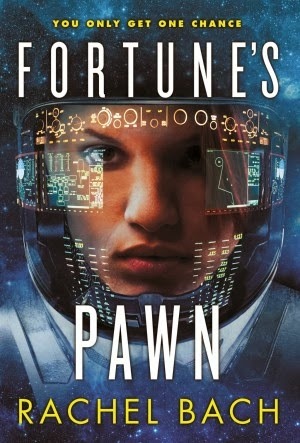 As the only known representative of this new sub-subgenre, Fortune's Pawn was actually pretty great, on both the space/sci fi side and the interstellar romance side of things. Despite having caught a terminal case of romance years and years ago (love that won't end until I'm dead, and who knows? Maybe not even then! ), I preferred the tough battle armor mercenary side of spunky protagonist Devi Morris's personality to the gushy mushy kissing (etc.) stuff. That isn't to say that the love story between Devi and Rupert is poorly done, per se; it's more a compliment to the space stuff, especially the thought of battle armor being to future combat and gender equality what the Colt revolver was supposed to be between women and men: the great equalizer. It's just plain awesome to have a girl smacking sense into big tough men, and it's a situation that's more believable when we're talking about some amazing combat armor rather than five minutes of karate lessons in the backyard (I'm thinking of you, Buffy/Sarah Michelle Gellar! Try raising your leg more than six inches off the floor when you deliver a "powerful" roundhouse kick next time!). Rachel Bach is a talented writer, there's no doubt about it—she spins together a story of a world very different from our own in some important ways, yet it all somehow works. Partly this because she adroitly avoids the exposition trap, i.e. the compulsive need to explain any unfamiliar technology in a ham-handed way; instead, she lets the uses and dangers of each such technology speak for themselves over the course of the story. After all, this isn't hard science fiction: readers would probably be unfazed to learn that this or that technology (hyperdrives, for example) are impossible according to all known laws of physics. That's not really the point. Through the first-person narration (which brings us such priceless internal monologue one-liners as "Arguing with him was like arguing with a dead apple tree—fruitless"), we get a very clear idea about the motivations—and desires—of Devi, a great spacemance character if ever there was one. She's got plenty of pluck, and whenever she finds herself in over her head, she just punches someone else into the shape of a flotation device (so to speak). The romance side of things is almost a let-down after all that coolness. Stuck on a small space-faring vessel with an ornery captain, his sister-in-law, a meatheaded fellow merc/character foil, a dreamy hippy, a catatonic teenager, Big Bird (because the navigator is literally a large avian), a carnivorous reptilian life form, and a mysterious, dashingly handsome uber-cool cook slash spy type harboring a deadly secret, it doesn't exactly come as a surprise who she picks to fall head over heels over; the surprise is that she goes all gushy in the first place. It feels like she's being subordinated into what the T-101 humorlessly referred to in Terminator 3 as a "human pair bonding". Why can't the story just be about her kicking her enemies into dust? And worse yet, why does the man have to be totally more powerful and dangerous, in the end, than the woman? Put differently, why does every romance have to be about a weaker girl and an Edward Cullen type, where it becomes about his awesome self-control in not ripping her to shreds or whatever? I won't deny that it was an exciting pairing—tough girl meets exotic eye candy who is more than he seems—but I would've been totally fine with a spacemance story without the mance, if you see what I mean. That said, Fortune's Pawn was a real page-turner and I, for one, am very much looking forward to book two, and a continuation of Devi's adventures! Nerd coefficient: 8/10 Well worth your time and attention! Note: don't think of this score as a B-; instead, think of it as showing that Fortune's Pawn is better than 80% of all books! You see, we score on a bell curve, with very few books getting a 2 or 3 and very few an 8 or 9 (and as for 1s and 10s, practically none! ).